I have this seat for my oldest daughter and she loves it. We switched her to it when she was about 3 and used the 5-point harness. She is 5 now and still using it we use it with the seat belt like a booster seat. It has lasted and still looks the same as when we first bought it. Definitely a good buy. I love the colors to this car seat. 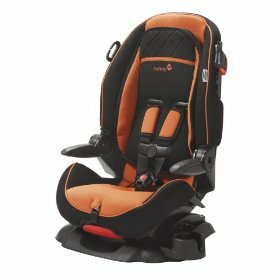 My son is 10 months and Iam ready to switch him to a much more comfortable car seat, the price is not bad either. We have only owned this for about a week, but so far it is a great seat. My 2 1/2 year old son seems very comfortable in it. He loves the orange color and the fact that it is a "big boy" seat. I love that it has the 5-point harness until he gets a little bigger and then it can be used as a regular booster seat. I feel safer to have him in the harness. The harness is very easy to adjust and the headrest adjusts as well. The seat goes up to 100 pounds so he should be able to use for a long time. It also has the energy absorbing foam. A great purchase that will hopefully last for many years to come!